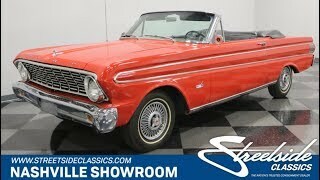 Hi, I am interested in your 1964 Ford Falcon (stock #0861-NSH) listed on Autotrader for $19,995. I'd like to get more information about this vehicle and confirm its availability. Here is something a little bit different for your entertainment. A car you dont see on the road every day. A convertible from the days of black and white TVs when Ford sponsored shows like the TV series Hazel . Check out this time machine. You may decide its exactly what you need to escape in and relax a bit. There is just something right about red convertibles. This one in particular. The Falcon was redesigned in 64, and again in 66. So, there is only a few of these cars out there. The last convertible Falcon ever was produced in June of 65. In the redesign, it was squared off and given sleeker body lines to appeal to the younger crowd. A nice chrome bumper leads the way with a sharp looking eggcrate grill containing the headlights just above it. Down the side of the car is a body line that tapers wider toward the rear and is highlighted in chrome. At the rear of the car, a shorter, flatter trunk lid picks up the top body line from the side of the car and carries it all the way across and around to the other side. They kept the round taillights which still looked great and dressed up the panel between them with some brushed aluminum just over the chrome bumper. As great as the outside of this car looks, the real star of this show is the interior. Open the door and you are greeted by a black, horizontally pleated door panel with a brushed metal band separating the top from the bottom sections. The upper section has a Futura emblem with a red, white and blue stripe running through it. Next, you cant help but notice the super cool looking seats. Black vinyl with red pleated inserts and gold piping. Sweet! Have a seat and check out the black steering wheel with the semi-circular horn ring and Falcon center. The dash is black with chrome and polished aluminum too. A wide speedometer with a big sweeping needle is flanked by two pods with the basic engine gauges in them. An AM radio sits in the center, and the glovebox emblazoned with Falcon is off on the right. The power convertible top looks good up or down and gets to either position at the touch of a button. If you appreciate the way things used to be, you will like the drivetrain in this car. Hot rod V8s are nice, but they are not for everyone. If you enjoy slowing down a bit to enjoy the ride, then relax and enjoy the smooth, gentle power of the 200-cubic inch in line 6-cylinder engine in this car. It sits in a neat and clean engine bay and looks good with its orange air filter and valve cover. There are signs of regular maintenance with newer plugs, cap, rotor and wires, and there is easy access to everything with this design, so if you are mechanically inclined, you might want to handle those things yourself. Another fun feature is that you get to shift it with the 3-speed column shifter. Just like the old days. Days that some of the youngsters today should maybe get a taste of. The rubber meets the road through 185/80R13 white wall tires mounted on steel wheels with wired, spinner hub caps. Come on down and check out this classic convertible. It will take you back. And forth. And on adventures in sweet top down style.